Arthur Joseph "Art" Rooney II (born September 14, 1952) is president and co-owner of the Pittsburgh Steelers of the National Football League. The eldest of nine children of Steelers’ chairman, Dan Rooney, he is the grandson of Steelers' founder “The Chief”, Art Rooney, Sr. He was named team president in May 2003. Prior to that, he served as vice president and general counsel of the Steelers, and has served on the board of directors of the Steelers since 1989. 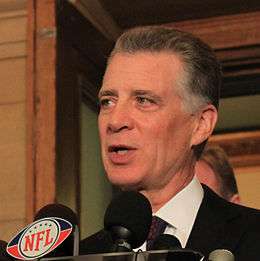 He currently serves as chairman of the NFL’s Stadium Committee, and serves on numerous NFL boards, including the Legislative Committee, the Management Council Executive Committee, the International Committee and the Digital Media Committee. Rooney graduated from the University of Pittsburgh in 1978 with a B.A. in Political Science. He then attended Duquesne University’s School of Law, where he earned his law degree in 1982. He currently holds an Of Counsel position with the law firm Buchanan Ingersoll & Rooney. He is active in the Pittsburgh community, devoting a substantial amount of his time to various organizations. He currently serves on the boards of the Pittsburgh Public Theater, Saint Vincent College, and the United Way of America.